1. Sponsor a family’s Monthly Expenses. 2. Share your time and ears to our distressed ladies. 3. Sponsor House repair for Family. 4. Be part of our Re-living Project. 5. Need Rs.5 Lakhs of rolling fund for the Agriculture Production. 6. Donate for our Spotlight Project. In celebration of Women’s day Punyam would like to express their gratitude to BAMA (Bay Area Malayali Association) for extending their hand to help one of our families. With their help we are able to give a family, who has faced many hardships, a beautiful cow. This very special family’s main breadwinner is a young transgender girl, who stopped her studies to take care of her cows, hens and goats for a living. Her mother is a mental patient who is unaware of the father of her two children. Her biggest dream is to run her own farm. Thanks to BAMA, her dreams are that much closer to becoming true. A team from US sponsored the entirety of the project and we have started rebuilding in February 2019. This project is expected to be completed mid-April. Building a house for a distressed family of dad(Asthma Patient),mom( Heart Patient) ,Son(sick), daughter in 10th grade. They lives in this one room house, which is about to collapse. Rs.5 Lakhs is the estimated cost and Punyam has fund of Rs.50000. Sponsors needed for this dream project. Activities: We worked with 65 families to provide them with some immediate needs like: kitchen utensils, stove, motor, fan, bed sheets, medicines, clothes, blender, bicycle, cupboard, etc. Pilot project started in Kunnukara. We are planning to expand this to 4 other Panjayths. 2. Trained women in driving tractors and coconut plucking. 3. Conducted over-night camps to bring back hope and happiness in depressed ladies. 4. Identified areas to develop agriculture and plant vegetables to generate income and produce for the affected families. 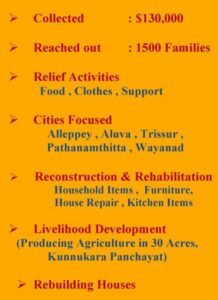 Activities: Created job for 25 women tailors and distributed Punyam brand nighties and underskirts in flood affected areas. Activities: Punyam distributed food kits for 100 families. Activities: Distributed 50 grocery kits for no-income families. Activities:Punyam distributed food kits for 100 families. 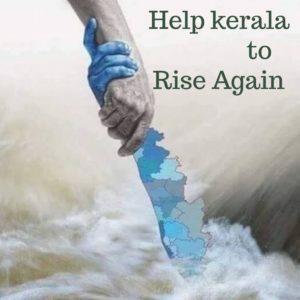 Areas – Alappuzha camps for people from Kuttanadu, Chenghannor, Aluva, Pathanamthitta, Wayanadu,Chambakkulam,Punnamada, and Chenghamanadu. Activities :Constructed one shed in Alleppey. a. A bare minimum steel and composite structure which will be flood and storm proof for at least three years. b. This can be added to a new house in future, either on side or top of the new house. c. This can be erected quickly, say within a week of approval. d. Can be fabricated at a convenient place, transported to the site and assembled in site, using nuts and bolts. e. Can be used as a space for a commercial activity in future or can be sold by the beneficiary. a. Length 16 feet and width 8 feet. These dimensions are selected since most of the composite materials like cement particle board etc. are available in 8 feet by 4 feet sizes. Depending on fund availability, the size can be increased in multiples of 8 or 4 feet. Activities: Punyam is acting as a gap filler in this project. Punyam served as a pathway for the families to resume making a living. We generated long-term jobs and hope for 25 families in Kunnukara. Our funds were mainly used for surveys, seeds, fertilizers, chemicals, transportation and labor. Surveys and training in Kunnukara and Puthenvelikkara were completed. Paddy fields of Kunnukara were plowed. 20,000 Grow bags were filled with tomatoes, eggplants, chillies. Before and after pictures of our farms and our activities are attached.